I'm not proud of this but it's been nearly four months since I last worked on my KonMari checklist. For two months I was on a roll and then I hit a giant roadblock - aka life! But, I'm hoping to jump on the bandwagon again because I've learned that this method isn't easy but it's SO worth it! All the work that I completed in the first 8 weeks has still held up! My drawers are still neat with nicely folded t-shirts and my closet still makes me smile when I walk in. I call that a huge victory! But, just because I won a couple of small battles didn't mean I had won the war with clutter. I still have a long way to go but I'm committed to seeing this through till the end. I would love to have you join me! This challenge is based on Marie Kondo's book The Life-Changing Magic of Tidying Up: The Japanese Art of Decluttering and Organizing! Read it, take notes, take a deep breath, and then dive in! We all deserve to live in a place that brings us joy! This week's challenge involved electronics and music. When I originally read The Life-Changing Magic of Tidying Up: The Japanese Art of Decluttering and Organizing I wasn't sure I could clean out the way she mentioned in her book. Marie (yes, I totally feel like I would be on a first name basis if I happened to meet her!) focuses on categories. In my previous purge life, I focused on rooms. I wanted to go through and organize the whole room - top to bottom, left to right... My focus and drive would last for approximately one room and then I was ready to give up. 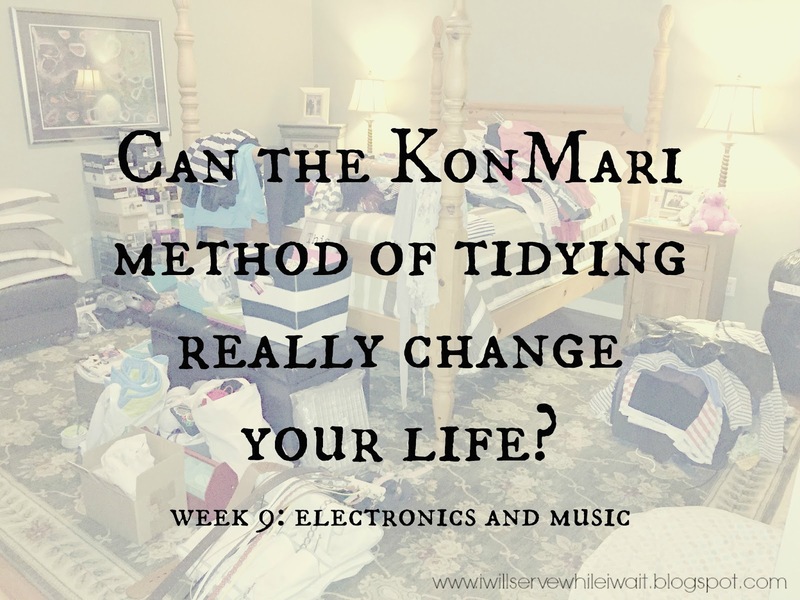 Since what I was doing wasn't working, I thought I would give the KonMari method a try. After seeing quick results, I was hooked. So, if the thought of electronics and music sounds a bit weird, it is, till you give it a try! For this week's challenge, I went around and grabbed every cord and electronic device that I could find. Only once they were all gathered together did I begin to make the decision whether to keep or toss. We had cords in multiple drawers, on multiple counters, and plugged in at various places around the house. This was one area that was driving me crazy! Old cameras...so many old cameras! To be completely honest, I wasn't sure what to do with the old cameras and a few other electronic items. And, I have one more area to clean out that I'm confident will have even more un-used electrical equipment. With these items, I put in a box to deal with all at once at a later time. With the above items out of the way, I was ready to tackle what we actually used. Mari mentions in her book to visualize how you want things. This was so easy for me as I had dreamed about this tiny space for some time! Before you start, visualize your destination. 2. Identify why you want to live like that - ask yourself "why?" Electronics are a way of life. This is something that will not change. What needed to change was the way our family approached the way we stored our electronics. After evaluating what we had, I created a simple charging station. This has been a game changer! No more "mom, have you seen my charger?!" or wires all over the kitchen counter. This area is definitely one of my favorites! My hubby also installed USB outlets - allowing us to charge all the devices in one spot. I found the charging station here, the wifi printable here, and the vase at the Target dollar spot! It's perfect for all those extra cords and headphones! To get rid of what you no longer need is neither wasteful or shameful. 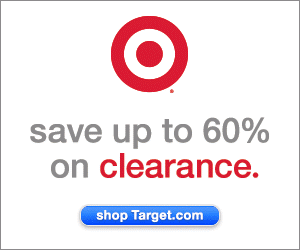 * Discard all your empty electronic boxes! "Turning your space into a storage shed for empty boxes costs you more than what you could earn selling an appliance in a box." * Toss cords that you cannot identify! "If you need it, it's quicker to buy a new one." While I worked through this week's challenge, I was left wondering "why do we have so much stuff?!" *TRUTH STATEMENT - We have WAY too much stuff. We know this and have known this but working through this method has exposed this on a grand scale. I don't share this with you to show how much we have but merely to show you how much stuff accumulates if you don't deal with it. I'm sharing in hopes that someone will be encouraged and begin taking back their life from their stuff. We all deserve to be surrounded by only things that we love and bring us joy! Question: Why do we have too much stuff? It's true. Until you gather like items together, there's really no way to truly see how much you have. Going through this process hasn't been easy but it's something that I'm committed to. Less truly is more! Thank you for stopping by and checking in to see how the progress is going! I've missed working on the challenge the last few months but am anxious to continue! If you are working through de-cluttering and organizing - stay strong! We can do this! It really is worth it! 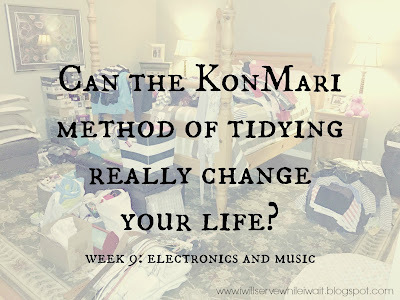 I also recapped my first few weeks on the KonMari journey and you can read more of that here. If you are still wondering if The Life-Changing Magic of Tidying Up: The Japanese Art of Decluttering and Organizing book is right for you, I urge you to at least read it and give it a try. I was at the point where I knew my current method wasn't working and thought I might as well give it a shot. I've got a long way to go but I know it will be worth it! Join the journey with me! This post contains affiliate links, which means that if you click on a link(s) and purchase an item I receive a small commission. Thank you for supporting While I'm Waiting...! Wow! I have permission to throw away unidentified cords??? Thank you!! I love your charging station! What cord are in that gorgeous vase?? You absolutely do! :) The vase holds extra chargers (for when we travel and ear buds). Thanks so much for stopping by! Love!!!! I just added USB outlet to the list! Keep it up friend - you can do this! Thanks for your sweet encouragement! I have to remind myself that it didn't get this cluttered over night. It will take a while to get through. But so, SO worth it!!! 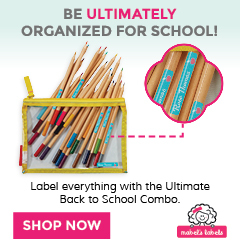 It has certainly changed the way I fold and organize and store things. Plus I am trying to get my 23 year old to come to the dark side and realize its OK to toss things that no longer bring us happiness! Keep up the good work! Love seeing it! I wondered when we'd get back to this. I have to deal with my remotes, and I have a plan. I've been wanting to dive back in but if I can't give my all, it won't happen! Hoping to get through a few more categories before school starts back up! I always feel so much better when things are tidy! Thanks for checking back in!!! I'll be returning to this post a number of times in order to really do the work! Thank you. Love having you join me, Jean! We can do this!!! This is so good! As newlyweds, we now have double the cords, chargers, and electronics, so I need to go through them all and figure out what we really need and what is just lying around causing a clutter. Love the USB plug! We need to install of few of those in our house. Thanks, Jessica! We've changed out two for now. Definite game changers! Thanks, Janet! Happy to have you following my journey! Would love for you to stop by again soon! Have a super weekend!!! Cords, batteries and keys are always the clutter monsters I never know how to organize. Cords are tough! I was found a fabulous battery holder (pretty sure it came with a big package of batteries from Sam's) and it works fabulous! Holds multiple batteries of multiple sizes. Sadly, I haven't been able to find another one. Amazon doesn't even have it! #gasp! :) Proof that the little things add up to a big mess! Just keep swimming, just keep swimming, right?! 20 years! That's impressive - and scary to think about how much could accumulate during that time! We've only been in our house 9 years and, well, ugh! 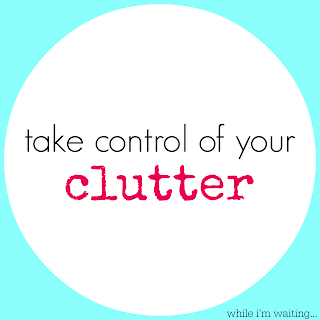 :) It's a great time for you to de-clutter. It will make moving into your new home even better! I think you will definitely like the book! Let me know once you read it what you think! Thanks so much for stopping by and for hosting! Hope to see you Friday! I'm so loving my charging station! Even though it's in our bedroom just having it all together has been a huge plus! It truly is the little things!! !